Why do some movies stick with you more than others? 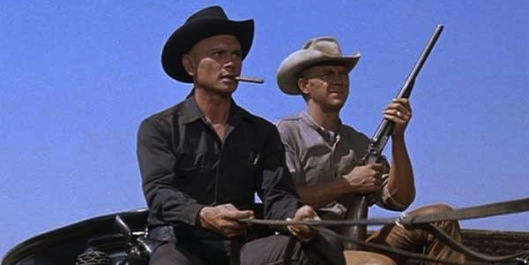 I grew up watching westerns and war movies from the 1950s and 1960s, movies that still dominate my all-time Top 10. Movies like “The Alamo”, “The Great Escape”, “The Dirty Dozen”, “The Good, the Bad and the Ugly”, “The Professionals” and several others. They still resonate now more than a few years later. 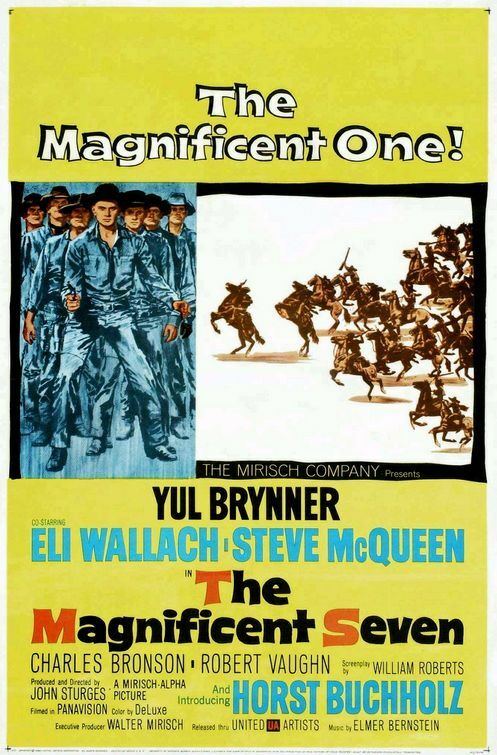 Oh, and of course, 1960’s “The Magnificent Seven”. I’ve reviewed all four movies (the original and the 3 sequels), but with the 2016 remake from Antoine Fugua, it’s time to look at this classic again. The original is still the best and one of the best westerns ever as well as a personal favorite. South of the border in a small farming village, a bandit named Calvera (Eli Wallach) rides in and steals almost everything he and his gang of 40 bandits can carry, leaving just enough for the village to survive and start all over again. The villagers decide they’ve had about enough, riding north into Texas to buy guns so they can fight back against Calvera’s gang. Instead, they meet Chris (Yul Brynner), a mysterious gunfighter clad in black who recommends they hire men rather than buy guns. Chris agrees to help, recruiting six other gunfighters from varying backgrounds, including an amiable drifter and gunfighter, Vin (Steve McQueen), to help out. The money is poor, the mission is more than difficult and the odds are stacked against them. Chris and the six gunslingers ride south, ready to help the village and fight off Calvera, odds be damned. What a good movie. From director John Sturges (“Bad Day at Black Rock” and “Gunfight at the O.K. Corral”, aka a master of ‘Movies for Men’), “Seven” came along at an interesting time for the western genre. Things, they were a-changing. Westerns were becoming more cynical, darker, more introspective and eventually transforming into the spaghetti western or the folksy, revisionist westerns of the 1970s. As fondly as “Seven” is remembered now, it struggled upon its initial U.S. theatrical release, finding huge success in Europe and Asia before being re-issued in the States several years later. The movie is an Americanized version of Akira Kurosawa’s classic film, “Seven Samurai”, transplanting samurais for wild west gunfighters. It’s interesting for a number of reasons – from the music to the budding star power on display as well as the dark tone and the exciting action scenes. It’s a favorite of mine, a four-star review, and I won’t really debate it. So there! How about that casting?!? Much of the cast would go on to become huge stars, but here in 1960, they were relative unknowns. Brynner was the established star, with “The King and I” and “The Ten Commandments” already to his name, and he’s the pulse of the movie. His Chris is the unflappable leader of the group, a capable gunfighter who’s also got all the qualities a leader should have. Loyal, strong, and tough. McQueen steps up to the plate in his first starring role. His Vin is an easy-going, drifter looking for work, quite good with his gun but maybe looking for something else in his life. Brynner and McQueen had a tumultuous relationship on the set – McQueen always trying to upstage the established star – but the result is more than solid. Their chemistry crackles, their scenes together offer that perfect dynamic between a commander and his right-hand man. As the bandit Calvera, Wallach is an effortless scene-stealer, disappearing for huge stretches only to return with a vengeance. And then there’s the rest of the seven, because Brynner and McQueen weren’t enough, right? Right?!? First, there’s Charles Bronson as Bernardo O’Reilly, a half-Mexican, half-Irish gunman who has quite the reputation for cleaning up nasty jobs and his price is high…usually. He bonds with three boys from the village who “got him,” promising to watch over him and care for his grave should he die in battle. Then, there’s James Coburn as Britt, the laconic, knife-throwing specialist who has few equals with knife or gun. Coburn says about 30 words the entire movie and steals every scene he’s in. Robert Vaughn plays Lee, a hired gun who’s lost his edge, convinced he is facing his death. Then there’s Brad Dexter, who plays Harry Luck, a friendly gunslinger convinced there’s more to the job than Chris is saying. Finally, there’s German actor, Horst Buchholz as Chico, the young, unproven kid looking to make a name for himself with his more established cohorts. As if that star power wasn’t enough to carry a movie, the characterization of these gunslingers really make the movie here. That’s something I’ve picked up on repeated viewings as I got older. The portrayal of these hired guns is honest, not looking to glamorize these men. They’re tied down by nothing, drift along from job to job, all the while risking their lives knowing that any job could be their last. What do they have? Their guns, their horse and maybe most importantly, their word. 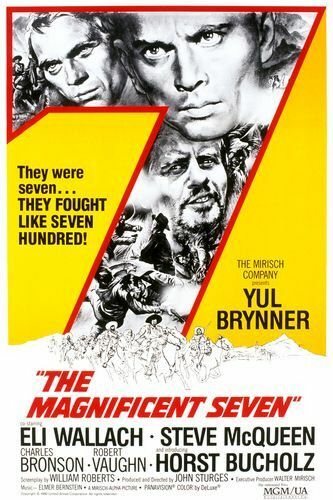 “Seven” boasts one of my all-time favorite scenes, in westerns and films in general. Given a chance to run from a battle against seemingly insurmountable odds, they opt to stay. Coburn’s Britt famously says “No one throws me my own guns and says run….Nobody.” When offered the chance to run, Vaughn’s Lee is told “Go ahead, Lee, you don’t owe anything to anybody.” His answer? “Except to myself.” That’s the essence and spirit of the movie. Men in a nasty situation doing what’s right because it’s what they should do. Profoundly simple, yet it always sticks with me – these men living by their code and what they believe in. As for the villagers, look for Russian actor Vladimir Sokoloff (“Road to Morocco” and “For Whom the Bell Tolls”) as the Old Man, the village patriarch who has little use for the whiny farmers. Jorge Martinez de Hoyos as Hilario, the fiery farmer ready to side with the gunmen, Pepe Hern and John Alonzo his close friends and Rico Alaniz as Sotero, the quasi-mayor of the village trying to weigh all his options. Lastly, Rosenda Monteros as Petra, the young woman in the village who takes a liking to Buchholz’s Chico. Also look for familiar western faces, such as Robert J. Wilke, who gives Coburn’s character a hard time when he’s introduced and Whit Bissell as the town Undertaker, in quick scenes. More than anything else though, I think what’s lasted the longest in the social conscience is composer Elmer Bernstein’s musical score. The soundtrack is one of the all-time greats, the main theme a whistle-worthy track that will be running through your head for days. This is what big movie soundtracks can be. They add something to the movie itself, like a new but essential character. If you’re not familiar with it (and even if you are), listen HERE. Just a great score, moving, adrenaline-pumping and emotional as needed. An all-time great score from an all-time great composer. The story covers a lot of ground over its 128-minute running time. It’s fairly episodic, starting with the essential and entertaining recruiting of the team, as Brynner’s Chris seeks out gunmen for the job. Each snippet gives each actor his chance to stand out on his own before becoming part of the group. Coburn’s classic introduction especially stands out. From there, it’s one great scene after another, both as entertainment value and for delving into all the characters who form the Seven to the villagers to our villain, Calvera. There isn’t a ton of action, but the gunplay stands out, two featured sequences as the Seven tangle with Calvera’s gang. It’s the final battle that packs the emotional punch, the odds finally taking their toll on this group of gunfighters we’ve come to like and root for. It’s a downbeat ending when you really consider it, but it’s the right ending for this story and the characters. Just a great movie. It was a favorite growing up and always will be. One of the best westerns ever, and an easy one to recommend for fans of the western genre or for someone just being introduced to the genre as a whole. A classic: plain and simple. And then there’s the remake coming out soon.